Symbolism: These angels are seen guarding the gates of Paradise, with the symbolic eye radiating its all-knowing beams. These angels prevents all from entering who do not know their own Divine nature. Tha candle signifies the flame of wisdom, without which we are unable to experience the joys of Paradise. Angelic function: To bring wisdom into the lives of us all. Gifts for human beings: They can help you to become receptive to the wisdom of God; find wisdom in your life; seek wisdom in all your experiences. These angels are the bearer of God’s wisdom, which is carried throughout the universe to all those who seek to know The Word of God. These angels help us find our wisdom by opening ourselves to the depths of our experience and knowing what is true for us. When we give ourselves the opportunity to reflect, synthesize and distil our personal experiences we find wisdom. With it we can progress along our path, enriching our understanding and deepening our spirituality. We are really only now beginning to see the wisdom in ancient teachings and re-apply it to our health and life-styles. Wisdom is an internal awareness which is projected on to the world around us so that we can live in peace and harmony. The Angels of Wisdom bring us the gift of wisdom. It says in the Bible that wisdom is more valuable than gold. Certainly we need wisdom for our growth and spiritual development. Without wisdom we are the mercy of the effects of the material world, and can easily lose our integrity and personal identity. Widom is something all cultures have honoured and acknowledged. Ancient civilizations respected and revered those who through their experience had come to understand the inner meaning of life and were able to make sense of loss, trauma and separation. This quality of wisdom is something we are beginning to re-evaluate in our modern world and, it is to be hoped, respect. We can seek the help of The Angels of Wisdom to guide us to the wisdom within ourselves. It is from this place that we can make healthy and wise choices for our well-being and happiness. We can offer our prayers to The Angels of Wisdom to show us how to make sense of the experiences of our life and how to find the meaning for ourselves. We can ask for wisdom for our healing and for the healing of our planet. It is surely through the gift of wisdom that we are able to find our bliss in life. 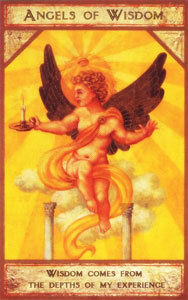 The Angels of Wisdom is there to help us all find the wise and healing path.